294 pages | 100 B/W Illus. 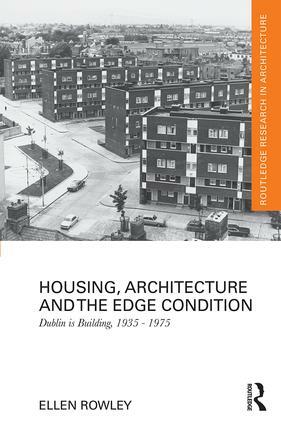 This book presents an architectural overview of Dublin’s mass-housing building boom from the 1930s to the 1970s. During this period, Dublin Corporation built tens of thousands of two-storey houses, developing whole communities from virgin sites and green fields at the city’s edge, while tentatively building four-storey flat blocks in the city centre. Author Ellen Rowley examines how and why this endeavour occurred. Asking questions around architectural and urban obsolescence, she draws on national political and social histories, as well as looking at international architectural histories and the influence of post-war reconstruction programmes in Britain or the symbolisation of the modern dwelling within the formation of the modern nation. Critically, the book tackles this housing history as an architectural and design narrative. It explores the role of the architectural community in this frenzied provision of housing for the populace. Richly illustrated with architectural drawings and photographs from contemporary journals and the private archives of Dublin-based architectural practices, this book will appeal to academics and researchers interested in the conditions surrounding Dublin’s housing history. "Contrary to de Valera’s rural vision of cozy homesteads, Ellen Rowley’s pioneering study shows that architecture and the built environment were forerunners of Irish modernity. Using extensive research and arresting illustrations, Irish city planning, rural development and housing policies are brought out of the archives in way that can only illuminate their shortsighted equivalents today. In times of acute shortages and economic protectionism in the new Irish state, slum clearances, suburban schemes and architectural design drew on international developments in Europe, Britain and the United States to give the lie to perceptions of disillusionment and inertia in the post-revolutionary generation. If Joyce’s Dublin was a city of words, Housing, Architecture and the Edge Condition is devoted to the often forgotten architects and planners who gave a concrete, everyday expression to the visionary ideals of a new Ireland." "Ellen Rowley tells the troubled story of Dublin’s housing architecture. She documents its cultural, political and even religious context. In the mid-20th century, housing was a preoccupation of Government policy. Despite their interest, architects played a marginal role in its production. Policy was dominated by political forces and, sometimes, by an unthinking urgency. The middle ground of urban infill sites was where architecture came to the fore, with the thoughtful buildings of Herbert Simms now recognised as exemplars of urban living. Ireland is now in a housing crisis worse than any in the 20th century. There are lessons to be learned from this engaging book." "In approaching the phenomenon from an architectural history perspective and assembling a vast amount of previously unseen material, Rowley provides a timely and eloquent reappraisal of a passage in Irish cultural, social and spatial history which hitherto has been at best misunderstood and at worst maligned: the mass production of social housing in twentieth-century Dublin." "If a turbulent programme of subsidised state-built dwellings driven by Nationalist demands and land redistribution marked the final phase of British rule in what became the Irish Free State, housing policies there from the 1930s to the mid-70s proved more nuanced. In this carefully argued account of the Dublin experience, Ellen Rowley traces the complexities and the actors involved – explaining expertly how such divergent estates as those at Crumlin (suburban cottages) and Ballymun (tower blocks) came into being." Ellen Rowley is an architectural and cultural historian who has written extensively on twentieth-century architecture in Ireland. She is editor and principal author of More Than Concrete Blocks: Dublin City’s Twentieth-Century Buildings and Their Stories – an ongoing research and educational project into Dublin’s built environment between 1900 and 2000, commissioned by Dublin City Council and co-funded by the Heritage Council of Ireland. Volume I, 1900–1940 was published in 2016 and Volume II, 1940–1972 will be published in 2018. Ellen co-edited Irish Architecture 1600–2000, Volume IV of Art and Architecture of Ireland. She is a research associate at the School of Architecture (APEP), University College Dublin, Ireland, and she has been the consulting curator of Dublin’s tenement history at 14 Henrietta Street, a new museum of Irish urban life and housing. Along with housing and the meaning of ordinary architecture, Ellen is deeply interested in the influence of the Catholic Church upon Ireland’s built environment and is working on a research project, The Architecture of Catholic Ireland, 1940–1980.